Will Smith has starred in lots of formulaic movies. And he knows better than anyone that there's something comforting as well as exhilarating about a movie that plays out according to a set of steps. Which is what makes Men in Black 3 so weird: it's a movie where the blockbuster formula is the opposite of comforting. The random plot twists and unfunny jokes in Men in Black 3 are so oppressive, you'll come away with a deep gnawing sense of the futility and meaninglessness of existence. This is a film so empty, it leaves you eagerly anticipating the heat death of the cosmos. The clever conceit of the first Men in Black movie was the way it combined two genres: the zany alien movie and the buddy-cop comedy. You kind of know what to expect from both of those genres, most of the time, but when you put them together there are a few new sparks. By the time Men in Black 2 came out, the combination of both felt just as tired as either of them on its own. So Men in Black 3 tries to jumpstart those two tired genres by adding a third often-predictable genre: the time-travel comedy. Unfortunately, mashing together three by-the-numbers storylines, and putting absolutely no thought into any of them, results in a movie that's not just meaningless — it's meaning-repellent. It's a film with the power to wipe out any meaning you may currently have in your own life. If you walk into Men in Black 3 believing in God, you will leave an atheist. If you walk into Men in Black 3 a Libertarian, you will emerge as a Socialist. Vegetarians will find themselves gnawing corn dogs in the theater lobby. You will probably cheat on your spouse if you watch this movie, and it won't be your fault. 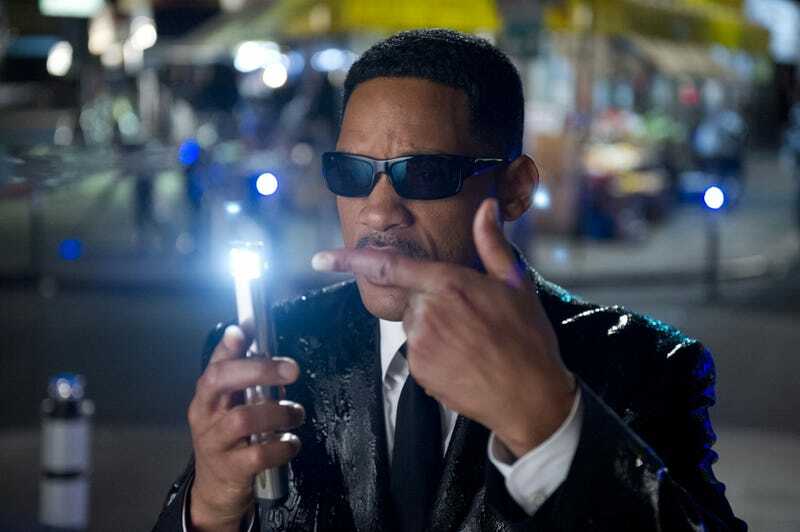 Because Men in Black 3 erases all sense of logic and sense in the universe, as surely as Agent J's Neuralizer erases people's memories. So at this point you're probably saying, "So what if this movie makes no sense? It's a summer blockbuster. They're not supposed to make sense." Which is fair enough. But what's particularly horrible about Men in Black 3 is that it tries to delve into the heart of the buddy comedy — the original genre that the first movie tried to cross-fertilize with science fiction — and find the meaning of the relationship between Agents J and K. And instead of finding an emotional core there, it finds a howling void. Oh, and I do feel guilty for hating another movie so soon after Dark Shadows — but this film left me no choice. You have to believe I did not choose this. In MIB3, J and K have reached a crisis in their 15-year relationship, because K is so dry and unemotional that J feels like he's being shut out. And then an alien biker dude named Lobo Boris the Animal (Jemaine Clement) travels back to the 1960s and kills K in the past, so he doesn't exist in the present. J is the only guy who remembers K, so he has to go back in time and save K's past self (Brolin). Along the way, he discovers the real reason why the present-day K is so uptight. And that's where this film really runs into trouble. As we mentioned earlier, Brolin is actually pretty great as the younger Agent K, and he damn near carries the film by himself. Tommy Lee Jones looks really exhausted and unhappy to be here, which sort of fits with the version of K he's playing but is no fun to watch. Meanwhile, Will Smith struggles manfully to fit back into the type of smart-assed character he used to play a lot in the 1990s and has made a point of not playing for a decade. Smith seems like he's trying to get through this by gritting his teeth, and ad-libbing a lot. There really is a major "collecting a paycheck" vibe from the two returning stars. The most you could expect from a movie like this is mindless fun. But because it's trying to have a serious character arc, and nothing in the film holds any water, the mindlessness actually gets in the way of the fun. And when I say nothing holds any water, it's not just your standard plot holes and random "Kirk gets dropped on the ice planet where Old Spock is" stuff. There are scenes where it feels as though lines of dialogue from other movies have been edited together in no particular order. Other linchpin scenes feel as though the actors are reading the Cliff Notes version of what's supposed to be going on. Things are set up that fail spectacularly to pay off. The movie contradicts itself in bizarre ways. There are set pieces that literally fail to work as fun action, because the logorrhea swallows up the film's physical vocabulary and destroys any sense of moving from A to B. By the time you get to the end, it's no surprise that huge stuff that was set up in the first act is not paid off in the third act. Other things that were set up with sledgehammer obviousness are resolved with the same mallet-to-the-head grace. Not only are most of the movie's funny bits in the trailer, the trailer contains some funny bits that aren't in the actual film. And this movie's ending really wants to be emotional and cathartic, and give you a new insight into Agents J and K. You're supposed to understand how they went from being Boys in Black to being Men in Black, and the deep emotional traumas that make them the people they are. The quest for the truth about the Boglodites and their invasion of Earth is also the search for emotional (and maybe spiritual, I guess) truth about these two men and their silent bond as alien-wranglers. But when this movie finally gets to the heart of Will Smith's relationship with Tommy Lee Jones/Josh Brolin, and why Agent K is so uptight, it's both pointless and cheesy. This is an emotional shaggy dog tale. As if recognizing that this all feels as though pages from many scripts were fed into a shredder and then consumed by a goat whose entrails were read by the actors before each scene, the movie tosses in a genuinely cute character: Griffin, an alien who lives outside of time itself and sees the universe as in flux. Griffin is constantly seeing the past and the future as well as other possible timelines, and he's constantly commenting on how random everything is. It's like the movie is feebly attempting to wink at the audience, but more in a "Hey bro, sorry I ran over your foot" way than in a "We're in on the lack of a joke" way. Which brings us back to the point: A formulaic movie can be comforting. There's something very life-affirming and sweet about a film where you basically know what's coming, and you can anticipate all of the steps that lead to a happy ending. But a movie which throws itself into three separate formulae — and fails to execute any of the three competently — is not comforting, or enjoyable. It is actually discomfiting. It is a buddy comedy which makes a mockery of friendship. It is a time travel movie in which we learn nothing about the past. It is an alien movie in which the aliens are boring. And so on. This is genre deprived of all the things that make genre fun, escapism without escape.